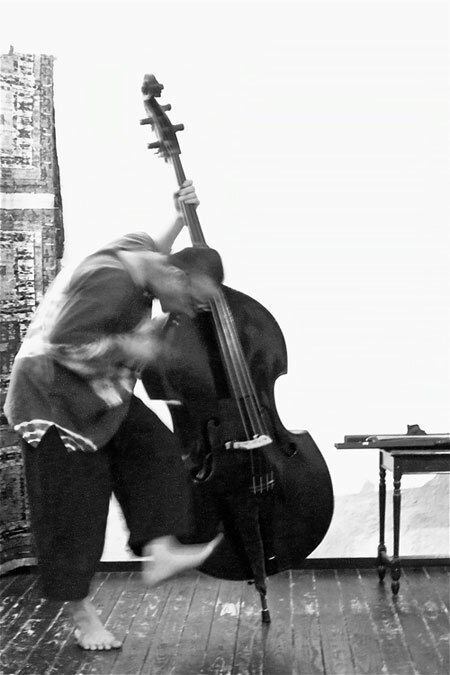 Maresuke Okamoto, contrabass cello and organizer, he was born in Tokyo, in 1960. Doublebass studies from 1974. He started improvised contrabass solo at Japanese improvised scene in 1982 while playing on Seikei University Orchestra(classic). In this period he played with lots of famous Japanese improvisers. Mototeru Takagi, Matoharu Yoshizawa, Sabu Toyozumi, Takehisa Kosugi, Yoriyuki Harada, etc and participated in New Jazz Syndicate(group for free improvised musicians). Now he lives in Tokyo and likes to play with acoustic musicians. “un croquis dans le ciel” is his organized festival. It isn’t only for improvised musicians but also for dancers, painters and more artists and “The Tokyo Improvisers Orchestra” was organized by him. Currently, He performs in the world improvised music scene in collaboration with various musicians. Carlos Zingaro, Emilie Lesbros, Frantz Loriot, Hugues Vincent, Hui-Chun Lin, Klaus Kürvers, Terry Day, Luo Chao-yun, Matthias Boss, Natsuki Tamura, Paulo Chagas, Recardo Tejero, Tristan Honsinger, Wolfgang Georgsdorf etc.